Got tired of the trunk lid hitting me in the head on my 10 year old Boxstir. Time to replace the struts, but not at Porsche prices. 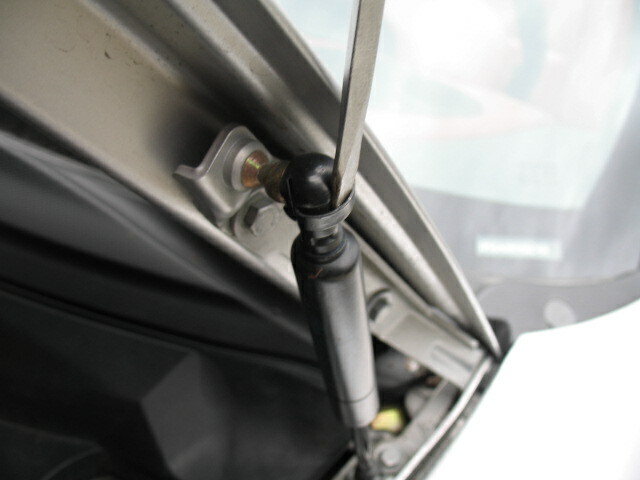 The struts are made by Stabilus. http://www.stabilus.com/default_e.asp The Porsche part number is 996 511 551 01 - same for 996. Dealer has them for $39.28 each. Went to Pep Boys down the street from the dealer because Pep Boys sells Stabilus. 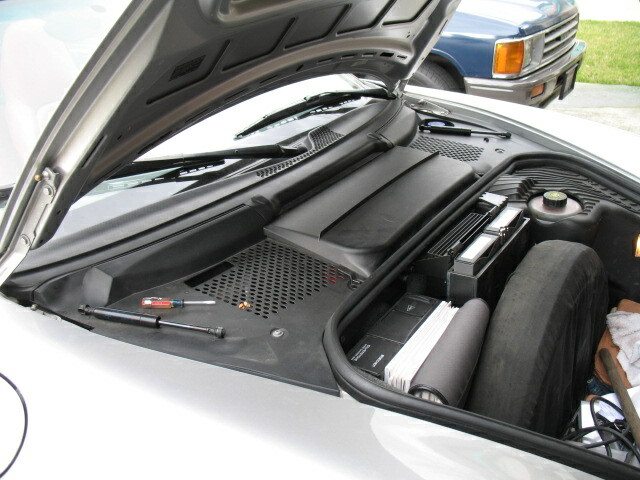 Of course Boxster struts were not in stock, but I looked them up in the Stabilus catalog and the front is SG406023. It is a special order but Pep Boys wants $44.80 each - more than the $39.28 price at the dealer. Ebay time. The cheapest was $39.50 for the pair, plus $5.50 for shipping. Total cost from ebay for the pair $45. They are made by Stabilus. First pic is the Pep Boys display. Second is the old strut on top and the ebay strut on the bottom. Third is a wood prop to hold the lid up while I removed the struts. To get them off you need to stick a small screwdriver under the clip and pry it back just a little bit. Then you can separate the ball joint. Watch out you do not scratch the paint when the joint separates. First pic is the screwdriver. Second shows both struts off. Third shows the dab of grease I put on the male joint. The female socket on the strut has a bit of grease in it, but I wanted some on the male part where the clip locks the joints together. To get the new struts on you can just push them on the ball joint - no need to mess around with the clip. OT: what is that between your amplifier and the spare tire? Toolpants - Thanks for the lead on the top treatment. I have Raggtopp cleaner and protector on the way, should have it tomorrow. Now a strut question: I have an Aerokit deck and wing and the struts won't hold up the deck. I assume whoever put the Aerokit on used the correct struts but I would like to make sure before I replace these. Do you know the correct PN for struts for an 01 with the Aerokit package? Porsche part number is 986 512 551 01 and the Stabilus catalog says SG406024. 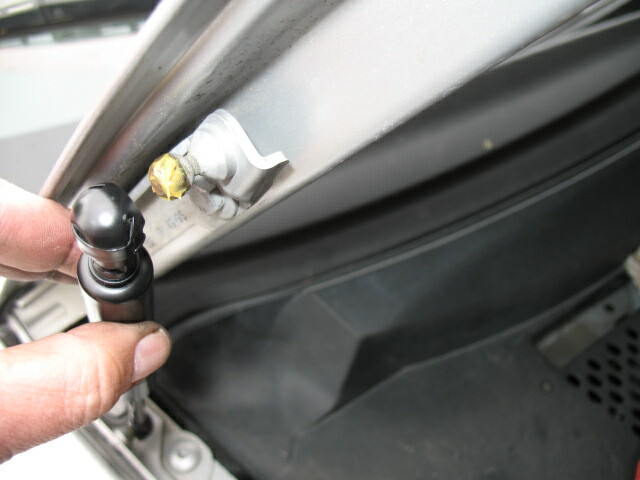 There is no special or heavy duty rear strut for the Aerokit. Looks like there is a rear pair on ebay for $39 plus $6.95 shipping. There is a gas in the strut and it leaks out over the years. My rears also need to be replaced one of these days. The Stabilus struts can be found on pelicanparts.com for $22.75. When my front lid was getting too weak to trust with my head under the hood, I started shopping around for replacement struts. I was being cheap and bought the Tuff Support brand for $14.25 at first. Bad move. After only about 10 weeks and a dozen or so openings/closings, the plastic ends broke on one and was cracked on the other. Returned to Pelican and bought the Stabilus versions. Much happier. Plus, you get free shipping for any order over $50. Nice info. Just replace on MY99. Thank you.